Easter is a time for resurrections and so El Reg noted with interest that Palm, after an eight-year hiatus, has signed up Verizon as the first telco to stock the device when it launches this year. Word of the development was first broken by Android Police. Palm owner TCL, which also has a licence to use the Alcatel and BlackBerry brands, acquired the Palm tag from HP in January 2015, but has done nothing with it so far that is visible to the public. The original Palm Pilot, launched in 1996, was a smash hit, arising from the ashes of the "pen computing" hype of the early 1990s. 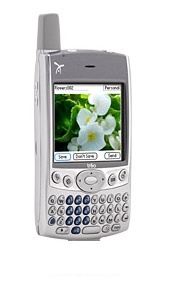 Palm launched its first true smartphone, the Treo 600, in 2003, and was still squeezing some life from the venerable PalmOS a year after the Apple iPhone debuted. Palm's final tilt at the market was spectacular but unsuccessful. Elevation Partners, a private equity firm backed by Bono from U2 (hence the name), threw $425m at a revived Palm to produce an iPhone killer, the Pre. The software was superb – many features have since been pinched by Apple and Google – and the advertising lavish. Elevation partner Roger McNamee boasted: "You know the beautiful thing: June 29, 2009, is the two-year anniversary of the first shipment of the iPhone. Not one of those people will still be using an iPhone a month later." Hubris followed. The new Palm Inc couldn't get the distribution right, giving failing carrier Sprint a long exclusive, and couldn't get its SDK out the door. HP picked up the pieces for $1.2bn in 2010, eventually throwing the OS over to LG for use in TVs.